The phospholipase A2 receptor (PLA2R) and thrombospondin type-1 domain-containing 7A (THSD7A) are the two major autoantigens in primary membranous nephropathy (MN), and define two molecular subclasses of this disease. Both proteins are large transmembrane glycoproteins expressed by the podocyte, and both induce IgG4-predominant humoral immune responses that produce circulating autoantibodies that can be used clinically for diagnostic and monitoring purposes. The biologic roles of these proteins remain speculative, although several features of THSD7A suggest a role in adhesion. PLA2R-associated MN was initially found to associate with risk alleles within HLA-DQA1, but subsequent studies have shifted the focus to the HLA-DRB locus. Three distinct humoral epitope-containing regions have been defined within the extracellular portion of PLA2R, and it appears that the number of targeted epitopes may determine disease severity. Although similar information is not yet available for THSD7A-associated MN, this form of MN may have a unique association with malignancy. Finally, it appears likely that other autoantigens in primary MN exist. Although protocols similar to those that identified PLA2R and THSD7A may be successful in the identification of novel antigenic targets in MN, newer techniques such as laser-capture mass spectrometry or protein arrays may be helpful as well. In less than a decade, human primary membranous nephropathy (MN) has entered a new phase, with the discovery of the two known autoantigens, the M-type phospholipase A2 receptor (PLA2R) and thrombospondin type-1 domain-containing 7A (THSD7A).1,2 These two proteins, relatively obscure before their link to MN, have been brought to the forefront of glomerular disease with others such as APOL1, suPAR, and angiopoietin-like 4, to inform our expanding understanding of glomerular disease at the molecular level.3–5 This article is not intended to serve as a review of the clinical or pathologic aspects of MN; for that, the reader is directed to a number of excellent recent reviews.6–10 Instead, this Brief Review will highlight the investigative paths that identified the two autoantigens in human primary MN, discuss similarities and differences between the two proteins and their associated diseases, and consider strategies to identify the remaining autoantigens in MN. Our classification of glomerular disease has rapidly evolved from categorization by common histologic patterns to one provided by a more detailed understanding of the molecular mechanisms giving rise to these patterns of disease. MN describes the histopathologic pattern of thickened glomerular basement membrane (GBM) caused by the deposition of discrete immune deposits beneath the basal surface of the podocyte, and later by the expansion of matrix material between and around these deposits. The source of these deposits was initially presumed to be from circulating immune complexes that accumulated in a subepithelial position because of size, charge, or other physiochemical properties. Thus, when Walter Heymann and colleagues introduced an experimental rat model that exhibited all of the clinical and morphologic features of MN after active immunization with proximal tubular brush border proteins,11 it was initially assumed that complexes of antibody and extraglomerular (brush border) antigens were responsible for the glomerular deposits. Critical to our current understanding of human MN autoantigens was the observation that sheep anti-brush border antibodies, in an isolated, perfused rat kidney system that did not allow the formation of circulating immune complexes, still led to the formation of in situ deposits, suggesting the presence of an endogenous glomerular antigen.12,13 This initiated a search for the antigenic component of the GBM or podocyte that was targeted by these antibodies. Ultimately, the work of several groups led to the identification of megalin (initially called gp330), now better known for its endocytic uptake of small molecules and proteins in the proximal tubule, as the target antigen in Heymann nephritis,14–16 which was shown to be present in the brush border fraction used to immunize the rats.17 However, hampering rapid translation to human pathophysiology, the additional presence of megalin on the podocyte (as opposed to its location in the brush border) was limited to the rat. Seminal studies by Pierre Ronco and colleagues in Paris identified a human podocyte antigen (neutral endopeptidase; NEP) that was targeted by maternal alloantibodies in rare cases in which the mother was genetically deficient for this protein,18 but the autoantigen responsible for adult idiopathic MN remained unknown. It was against this backdrop that the current story began. Our laboratory, led by David Salant, was not unlike other research groups searching for the elusive human MN autoantigen in using the well established laboratory technique of Western blotting, in which human sera from patients with MN were utilized to screen for specific reactivity with human glomerular proteins. Protocols for gel electrophoresis and Western blotting typically use heat and detergent denaturation of proteins, in the presence of reducing agents to break disulfide bonds. However, many autoantigens contain discrete epitopes that are dependent on conformation and domain structure, which are in turn stabilized by intradomain disulfide bonds. In an attempt to maintain more of a native structure, we performed gel electrophoresis of human glomerular proteins under nonreducing conditions. With this modification, a high molecular weight band emerged that appeared to be specific to sera from patients with primary MN,1 suggesting that the protein recognized by MN autoantibodies contained an epitope dependent on intact disulfide bonds. A detailed description of the experimental steps that ultimately identified PLA2R as the target autoantigen in MN is beyond the scope of this article, and the reader is instead directed to the original or other articles.1,19 Important points are that the newly observed antigenic band appeared to be a glycoprotein, in that enzymatic removal of N-linked sugar residues led to a large downward shift in electrophoretic mobility. Partial purification of this glycoprotein on immobilized lectin beads, and subsequent mass spectrometric analysis of both the fully glycosylated and the deglycosylated bands were critical components in the discovery process. Perhaps even more important in the identification process was the predominance of the IgG4 subclass of autoantibody in this and other autoimmune diseases. Because of the low overall proportion of IgG4 relative to the other subclasses of IgG in humans, a high signal-to-noise ratio allowed for clear identification of distinct bands by Western blotting. 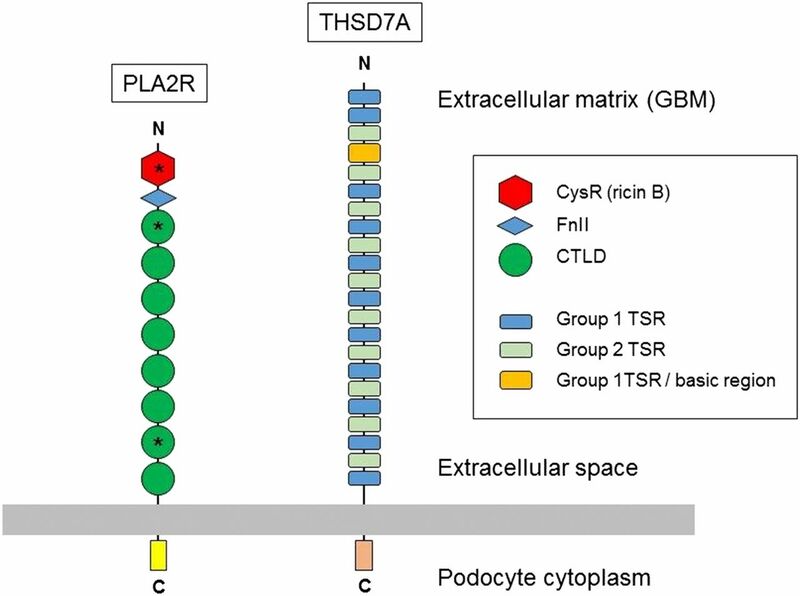 A schematic of the domain structures of PLA2R and THSD7A demonstrates that both proteins are large transmembrane glycoproteins with short cytoplasmic tails. The individual domains are denoted in the box. Asterisks indicate domains in PLA2R that contain known humoral epitopes. The fourth TSR of THSD7A is degenerate and contains a large region rich in basic amino acid residues. In contrast to this important information about the humoral immune response to PLA2R, genetic analyses have launched new paths of investigation into T cell epitopes. A genomewide association study that had been ongoing independently of the identification of PLA2R found two single nucleotide polymorphisms that were significantly associated with risk of idiopathic MN.31 The strongest signal came from the HLA locus on chromosome 6, centered on HLA-DQA1. Homozygosity for this risk allele increased the odds ratio (OR) for MN by 20-fold. The next most significant locus was in the first intron of PLA2R1 itself; here, homozygosity increased the OR for MN by four-fold. However, there was interaction between the two loci; homozygosity for both risk alleles increased the OR by nearly 80-fold. Although the most significant risk allele in PLA2R1 was intronic, this early study was not dismissive of a possible link to amino acid polymorphisms (coding mutations), as the intronic single nucleotide polymorphism was in linkage disequilibrium with several common amino acid polymorphisms. Ultimately, a follow-up study in which the exons and splice sites of PLA2R1 were directly sequenced was unable to identify rare or novel amino acid variations that were clearly associated with MN.32 Nonetheless, the interaction between class 2 HLA molecule(s) and PLA2R1 itself suggested a potential inter-relation via the immune system (i.e., presentation of a T cell epitope). Since these initial studies, several groups have confirmed that a signal for MN risk exists in or near HLA-DQA1,33–37 and that the specific HLA-DQA1*0501 allele (previously associated with idiopathic MN38) is associated with the presence of circulating anti-PLA2R antibodies.33,36,39 However, the HLA locus has a high degree of linkage disequilibrium leading to commonly coinherited haplotypes (see Table 1). DQA1*0501 belongs to a haplotype that also includes DQB1*0201 and DRB1*0301 because of the chromosomal proximity of these genes. In fact, the association of this haplotype with MN is not new,38 and many older studies dating back to 1979 have associated idiopathic MN with the HLA serotype DR3 in whites.40 Thus, despite a highly significant genetic risk allele within HLA-DQA1, the biologically relevant class 2 molecule responsible for presenting peptides from PLA2R could lie elsewhere in the HLA-D locus. Several research groups studying the genetics of MN in Asia have indeed found a risk signal within the DRB locus. Cui et al. performed selective HLA genotyping in a Northern Han Chinese population with MN to show independent risk alleles in DRB1*1501 and DRB1*0301.41 Higher resolution mapping localized the risk alleles to particular amino acid variants within the peptide-binding groove of the DR β chain protein, responsible for presenting antigenic peptides to cognate T cell receptors. Using predictive algorithms to identify which fragments of PLA2R would best fit within these variant DR HLA molecules, the authors identified sequences within CTLD1 and CTLD7, potentially linking the T cell and B cell epitopes of PLA2R. DRB1*1501 (and DQB1*0602, which is present in the same genetic haplotype) were also associated with idiopathic MN in a Japanese cohort,42 which also fits with several older studies linking the DR2 HLA serotype with Japanese patients with MN. Although HLA alleles or haplotypes may confer increased risk for a number of autoimmune conditions, common variants in the 5′ untranslated, intronic, and coding regions of PLA2R1 more specifically associate with PLA2R-associated MN and not non-PLA2R–associated MN.34 Disease-associated polymorphisms in the amino acid sequence have been discounted as a cause of MN,32 but a number of intronic risk alleles, especially in the 5′ region of the gene, may point instead to an alteration in the expression level or pattern of PLA2R, perhaps altering transcription in a way such that PLA2R can be better presented to the immune system. This will be an exciting area to follow in the coming years. These genetics studies clearly demonstrate a link to PLA2R-associated MN that does not exist for other types of primary MN, and suggest that the particular podocyte antigen targeted by autoantibodies may lie in part in our genetic make-up. It is clear that genetics alone is insufficient to explain why some individuals develop MN and others do not, or why the disease often starts later in life. Environmental (toxic, inflammatory, or infectious) exposures may very well contribute to disease initiation in susceptible individuals, either by molecular mimicry,25 upregulation of the antigen in barrier tissues due to inflammation,44,45 or other mechanisms.46 Some have proposed a multihit mechanism that may involve age-related changes to Ig molecules that confer the ability to activate the complement system via less frequently used pathways.47 It is also not clear why the disease is limited clinically to the kidney. Initial tissue blots have shown PLA2R1 mRNA expression in multiple tissues,21 and more sophisticated microarray and RNA sequencing data, as summarized by The Protein Atlas48,49 (www.proteinatlas.org), have demonstrated the expression of transcripts in a number of epithelial tissues, especially the thyroid and salivary gland, in addition to the kidney. Of relevance to the apparent kidney-limited disease, the only location in which PLA2R is readily detectable by immunohistochemistry is in the kidney glomerulus (www.proteinatlas.org). Even if there is low-level expression of PLA2R at other sites, differences in glycosylation or other post-translational modifications, or the ability of autoantibodies to reach the antigen because of the presence or absence of endothelial cell fenestrations, may dictate why autoimmune disease is not clinically apparent at other sites. The reasons underlying the variability in disease resolution (i.e., why some patients undergo spontaneous remission whereas others require single or multiple courses of immunosuppression) are not clear. Work by the Ronco group has recently demonstrated differences in immune cell subsets in a small number of patients who did or did not respond therapeutically to rituximab.50 As a whole, patients with MN had lower percentage of regulatory T cells within the CD4+ T cell population at baseline when compared with healthy controls. However, patients who clinically responded to rituximab demonstrated not only lower levels at baseline than nonresponders, but also a significant serial increase in percent regulatory T cells after treatment. Data are more limited in those who undergo spontaneous remissions, but it is reasonable to speculate that similar changes may herald an end to the immune response. Neither PLA2R nor THSD7A were widely known as podocyte proteins before their description as target autoantigens in MN, and the biologic function of these proteins within the podocyte or elsewhere is not clear. Although the general paradigm of podocyte injury in MN has been felt to be because of complement activated by autoantibody-antigen deposits,56 it is conceivable that either or both autoantibodies could also interrupt biologic function. There is precedent for this with regard to antibodies to both NEP in fetomaternal alloimmune MN and megalin in Heymann nephritis. Kerjaschki and colleagues have shown that anti-megalin antibodies block one or more ligand-binding sites, disrupting the internalization of apolipoproteins and leading to their accumulation in the GBM, lipid peroxidation, and further damage to the GBM.57 IgG1 antibodies to NEP can inhibit enzymatic activity, and may lead to persistence of vasoactive peptides responsible for the ischemic vascular phenotype occasionally seen in neonates with this condition.58 It is tempting to wonder whether anti-PLA2R or anti-THSD7A could similarly disrupt biologic function. A reasonable thought would be that the role of PLA2R in the podocyte, as its name might suggest, is to bind one or more of the small (13–18 kD) secreted phospholipase A2 enzymes that should pass readily through the GBM and slit diaphragm. However, whether such as a function would serve a protective or clearance mechanism, or has some other signaling function is unknown. Some have suggested that PLA2R may be important for binding or internalizing collagen through its FnII domain.59 Human anti-PLA2R sera were able to inhibit the binding of PLA2R-transfected HEK293 cells and podocytes to type 4 collagen in vitro.60 Future studies will be needed to confirm this hypothesis because a detailed biochemical analysis has demonstrated that human PLA2R was unable to bind or internalize type 1 or 4 collagen.61 A specific function for PLA2R in the podocyte needs to be reconciled with the fact that PLA2R is not expressed by podocytes in rodents and other small animals, although this does not necessarily rule out a function-blocking role of anti-PLA2R in human MN. There is more evidence for a functional role for THSD7A in the podocyte. A role in cell adhesion is supported by colocalization with focal adhesion proteins in human umbilical vein endothelial cells53 and primary podocytes in vitro.62 THSD7A is expressed at the very basal surface of podocytes in humans and rodents.2,63 In addition, immunogold EM images show that THSD7A is present in the foot processes and near slit diaphragms.64 TSRs are well known to bind to extracellular matrix, and a molecule composed of repeating TSRs is likely to fulfill this speculative function. Important for a potential noncomplement–associated disease mechanism, the addition of anti-THSD7A but not control IgG disrupted focal adhesions in cultured podocytes and led to alterations in stress fiber organization.62 Moreover, anti-THSD7A applied to HEK293 cells overexpressing human THSD7A caused cell detachment and apoptosis. In line with these in vitro observations, passive transfer of human anti-THSD7A to mice led to proteinuria before any detection of complement activation.62 The field will eagerly await further details about this exciting new potential mechanism of disease in THSD7A-related MN. All of the landmark antigens in MN (megalin, NEP, PLA2R, and THSD7A) are transmembrane glycoproteins, and one may question if such membrane localization enhances or impairs the formation of subepithelial deposits. The combined ability of an antigen to cluster into aggregates and to be shed into the GBM has been considered important for immune deposit formation.65 PLA2R is likely relatively mobile at the cell surface, clustering and being endocytosed in a constitutive fashion.24 How it is shed is less clear, although evidence from the mouse has suggested a metalloprotease-dependent cleavage event66 that has not yet been studied in humans. Such an event would be analogous to the regulated intramembrane proteolysis of megalin, a series of proteolytic cleavage events that lead to ectodomain shedding and the release of an intracellular fragment.67 We were unable to provide evidence supporting a circulating form of soluble PLA2R, but this does not rule out locally generated soluble PLA2R that could participate in deposit formation. The presence of an alternatively spliced, soluble form of PLA2R that contains the same epitopes as the parent molecule could also facilitate deposit formation.21 Although the ability of THSD7A to cluster within the membrane is uncertain, it may also potentially be cleaved at a juxtamembrane site,54 and its multiple TSRs likely enhance binding to the GBM to form subepithelial deposits. Soluble forms of these two proteins could also facilitate the uptake of the proteins by antigen-presenting cells to initiate or maintain a humoral immune response. Do All Paths Lead to the Same Disease? In spite of these speculations about the potential interference of autoantigen-specific functions in the podocyte, it is astounding that the same renal phenotype can occur with disparate antigens in primary and secondary disease, and despite utilizing different mechanisms of complement activation, an essential component of cell injury in MN. Although PLA2R-associated MN is a typically IgG4-predominant disease, with histologic evidence of C3 deposition in the absence of C1q, a case associated with monoclonal IgG3κ anti-PLA2R, with strong evidence of C1q and activation of the classic pathway, exhibits essentially the same phenotype.68 Similarly, genetic deficiency of mannan-binding lectin eliminates the lectin pathway of complement activation, yet still leads to a phenotypically identical disease.69 Future research in this area should seek to unravel both shared and perhaps antigen-specific mechanisms of disease (Table 2). Despite their similar phenotypes, there are two features of THSD7A-associated MN that may set it apart from its PLA2R-associated counterpart: a female predominance, which remains unexplained and awaits confirmation in larger cohorts, and an association with malignancy.2,70 The relationship with MN and malignancy has long been a controversial topic,51 as in some cases, there may be coincidental occurrence of the two disease processes in older adults, and in other cases, the MN may truly be secondary to the malignancy. One study has shown that the absence of anti-PLA2R was associated with a 37% chance of future malignancy, often early after the diagnosis of MN; in contrast, only 9% of patients with anti-PLA2R antibodies ultimately developed a malignancy and these tended to occur late, suggesting a coincidental process.71 PLA2R itself has been suggested to promote senescence and act as a tumor suppressor,72,73 and loss of PLA2R is associated with breast cancer,74 although relevance to any potential relationship between MN and cancer is not clear. The situation with THSD7A is different, as there appears to be a statistically significant increased rate of malignancy in THSD7A-associated MN when compared with PLA2R-associated MN.70 Two recent case reports suggest a unique mechanism of disease induction in this setting.70,75 Both patients with THSD7A-associated MN were discovered to have malignancy on further work-up: one with gallbladder carcinoma,75 and the other with a recurrence of endometrial cancer in a pelvic lymph node.70 In each patient, the cancerous tissue was found to overexpress THSD7A due to polysomy of chromosome 7, and a regional lymph node showed evidence of THSD7A uptake by follicular dendritic cells. The authors suggest a mechanism by which overexpression of THSD7A by the malignant tissue leads to regional presentation of the autoantigen to the immune system, followed by the emergence of a humoral response to THSD7A, which ultimately targets the glomerular podocyte and causes MN. A recent study catalogs THSD7A expression by a variety of tumors, and finds strong THSD7A staining in prostate, breast, renal, and colorectal carcinomas.76 However, overexpression or loss of THSD7A expression was not consistent; in colorectal and renal cell carcinoma, a lack of THSD7A was associated with worse outcome. In contrast, in prostate cancer, overexpression of THSD7A was associated with worse outcomes. Data were not available to assess association with MN or other autoimmune disease. Are There Additional Autoantibodies in MN? Autoantibodies to intracellular proteins (e.g., aldose reductase, SOD, α-enolase) have been detected in both primary and secondary MN.77–79 Some of these proteins are upregulated by the podocyte with disease, and may serve as neoantigens, driving the generation of further anti-podocyte autoantibodies. The extent to which they contribute to the persistence or worsening of disease course is not clear. Although not expressed at the cell surface under normal conditions, they may be aberrantly localized in disease and serve as additional cell surface antigens.78 It is interesting that there is typically not epitope spreading to other podocyte surface proteins. For example, the vast majority of PLA2R-associated MN, despite significant podocyte injury, do not involve the generation of autoantibodies to THSD7A.2 There have been rare cases of dual seropositivity to PLA2R and THSD7A.80 It is not clear what distinguishes these cases, but may relate to underlying genetics and the ability to efficiently present peptides from both antigens. In the end, PLA2R and THSD7A may represent only 85% of primary MN, leaving another 15% with potential autoantigens that remain to be defined (Figure 2). Histopathologic studies that have assessed the prevalence of PLA2R and THSD7A within the deposits of presumed cases of primary MN have identified dual negative cases,80 a proportion of which are IgG4 positive.81 It is possible that some of these represent false negatives, as a minor proportion of individuals with known circulating anti-PLA2R are found to have negative antigen staining on biopsy.82,83 Others have suggested that early in disease, when IgG1 may predominate over IgG4, PLA2R staining may also be initially absent84; however, these individuals were not tested for autoantibodies. However, given these data, it seems likely that there are still autoantigens responsible for primary MN that remain to be identified. 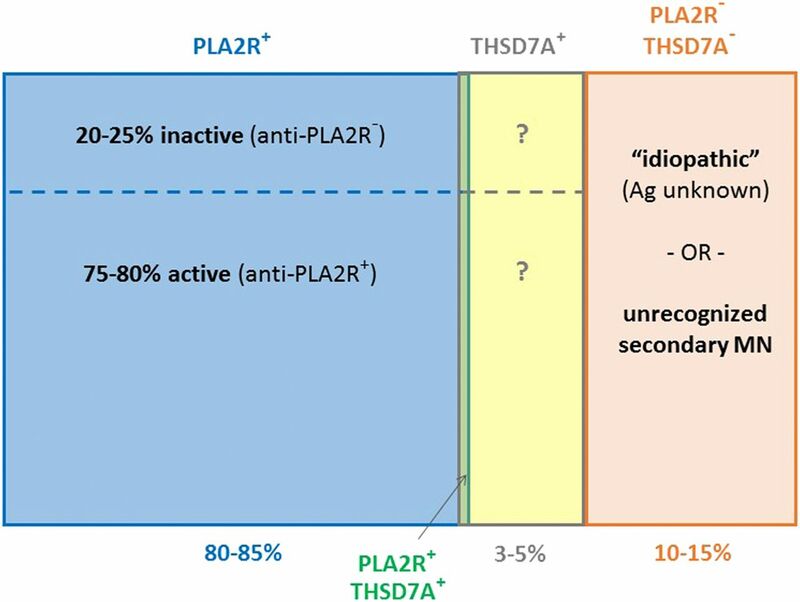 This schematic (not to scale) presents a categorization of primary MN into subgroups on the basis of association with the two known antigens, PLA2R and THSD7A. Each category may be further subdivided by the presence or absence of circulating autoantibodies, which in most situations is defined as if the disease is immunologically active or inactive, respectively. This breakdown is not yet known for THSD7A-associated disease, and cannot yet be determined for dual negative disease. Percentages refer to the proportion of all primary MN. Rare individuals have been found that have both PLA2R- and THSD7A-associated disease. Why then have they not yet been found? Table 3 provides a list of several possibilities. One hypothesis relates to the law of diminishing returns, in that the number of cases involving each subsequent antigen are vanishingly small, such that accumulating a large enough sample size in this already rare disease may be quite difficult. Another reason may be technical. The ability to detect antigens depends on a lot of assumptions inherent in the protocol used to detect PLA2R and THSD7A, which involves probing detergent-soluble native glomerular antigens with human IgG4 autoantibodies. It would be unrealistic to assume that identical methods would work for all remaining putative antigens. Although our protocol has quite a high signal-to-noise ratio for the detection of IgG4 autoantibodies, it is more limited in the specific detection of other subclasses of autoantibody. How do we get around these challenges going forward? Mass spectrometry has proved a powerful technique by which to identify proteins enriched in glomeruli, using laser capture techniques.86,87 Although candidate autoantigens may be intrinsic glomerular proteins, they may be enriched within immune deposits of MN, compared with control sections, and thus may be detectable using such approaches. Another potential methodology uses human serum to identify reactive spots on a protein microarray,88 and could potentially identify novel candidates in samples from patients with dual negative primary MN. In conclusion, the description of PLA2R and THSD7A as autoantigens in primary MN has fundamentally changed the way we approach the disease. This molecular subclassification of primary MN has already allowed for better diagnosis and disease monitoring,10 and we may be increasingly able to find clinical distinctions between types of MN, such as an association with malignancy. Discovery of new autoantigens and novel serologic markers of disease will be important to allow such monitoring and prognostication of the remaining 15% of patients currently without defined autoantibodies. L.H.B. receives royalties through Boston University related to the patent “Diagnostics for membranous nephropathy.” He receives research support from Pfizer CTI. The author would like to thank the many researchers and clinicians worldwide whose work and insight has provided the subject material for this Brief Review. John Farrell has provided helpful discussions with regard to the HLA genetics. L.H.B. Jr. is supported by National Institutes of Health, National Institute of Diabetes and Digestive and Kidney Diseases grant R01 097053. You are going to email the following PLA2R and THSD7A: Disparate Paths to the Same Disease?